After experiencing a time distortion, the Enterprise comes to the rescue of a temporal physicist whose experiments have gone horribly wrong. Picard also deals with his past when he meets an old flame. The displays keeping track of the fencing match are a nice touch. I think this might be the first time we see a futuristic version of an existing city that is not San Francisco. It's funny that there's a completely inexplicable tunnel shooting through the Eiffel Tower. 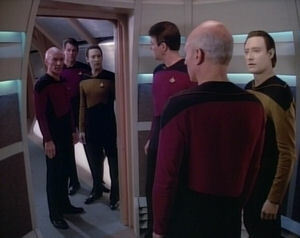 I love the trippiness of the "Manheim Effect," especially when Picard, Riker, and Data encounter themselves at the turbolift. Dr. Manheim needs a constant. Why does Data need Geordi to start a countdown? Doesn't he have an internal clock and a fixed sense of time, as he described earlier in the episode? I'm surprised by how little I remember this episode, because I really like it. The subplot involving Picard and his old flame isn't great, but it does show a side of Picard we don't see very often. The main plot, however, is pretty cool, and the science is vague enough to be plausible but specific enough not to feel contrived. Besides, I'm a sucker for time travel weirdness, of which there is plenty. This episode reminds me a lot of the episode "Parallels" and a little bit of the episode "Cause and Effect." The episodes of this show that deal in time all have a unique flavor, and you can already see it in this, the first one.